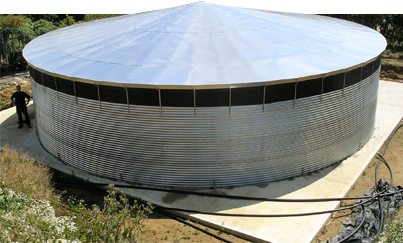 Incredibly strong and proven to last for decades, our corrugated steel water tanks are approved to BS5950 and BSEN1993 and are either galvanised with lead free zinc to 275g/m² to EN10142, or powder coated with durable, lead-free paint. All are UK Water Research Advisory Scheme approved, certificate number 0807044. All comply to a minimum safety margin of 40%:this means that the structure is capable of holding a minimum of 40% more water than the actual volume of the tank. With easy build kit forms, our tank capacities exceed volumes of 250m3 and we have a range of liners depending on the application and customer preference. We supply EPDM, FPP and PVC amongst others all in varying thicknesses. All liners can be supplied with a capping system, which is supplied in two parts the first capping protects the liner from the top of the steel and the second is installed after the liner and securely fits on top of the first capping giving additional protection to the liner cover. We provide a range of accessories to go with your Water Storage solutions from Ladders, Platforms, and Handrails to Pumps, Filters, and Valves. A complete water tank system delivered on one pallet meaning there are no unwanted surprises during installation.